Yesterday I had the opportunity to not only visit the Swaminarayan Temple in Kingsbury, but to work with the boys at their football club, Swami Bapa FC for the Swaggarlicious Soccer School as a result of sponsorship received from Juvenis – an organisation that promotes youth engagement. I have carried out several voluntary football sessions with the boys over the last 6 months with the view of strengthening community links and engaging those from Asian backgrounds to participate in football. The community is one that has much desire, enthusiasm and commitment which was certainly demonstrated yesterday with the assistance of both Dilan Mistry and Amrit Depala who helped to run the session delivery throughout the day. This is what the kids had to say……. 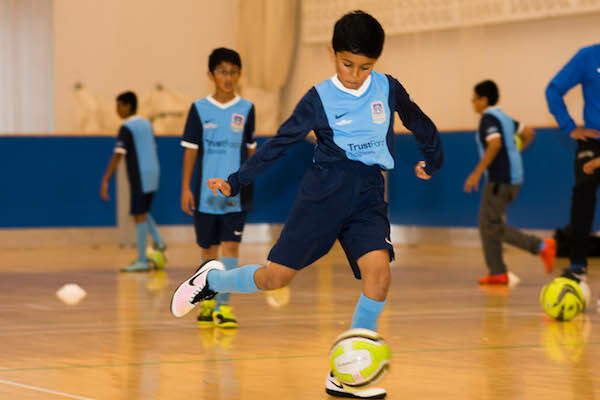 Harshil Ratna aged 9: “It was very fun and I enjoyed it because I learned new skills and I got to play football”. Sunay Pathani 13: “It was a great experience and I learned how to keep fit”. Maniche Patel 12: “We all learned quite a lot about how to be quicker and play and support each other during games”. “Days like today provide children with a great way to learn new skills, stay active and have fun in a safe and structured environment. Having the opportunity to be taught by professional coaches and get a glimpse into the focus, skill and determination required in professional football is invaluable particularly at a grass roots level”.